Having full independence with limited mobility is a constant struggle, and the freedom to take care of oneself is all the more important when it comes to personal hygiene. Thankfully, there are specialized aids, such as bath lifts, available for disabled, injured or elderly patients to take advantage of. Even caregivers can benefit from a bath lift, since lifting someone in and out of a bathtub puts a great deal of strain on the back. 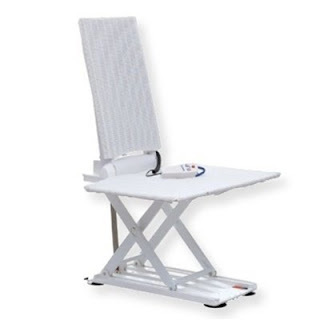 When it comes to choosing a bathtub lift chair, the Aquatec Beluga Bath Lift is a popular choice here at Preferred Health Choice. It’s safe, it’s a breeze to operate, and - the most vital element of all - it’s absolutely relaxing! The Aquatec Beluga is sturdy in frame yet soft in material. Its frame is made out of tough stainless steel and reinforced plastic that can withstand a lot of pressure as well as wet conditions. The overlaying cover is made out of a flexible rubber mesh that can easily be removed and thrown into the wash for cleaning. In order to cater to a wide variety of people, the bath lift can lift up to 300 pounds and is even latex-free for people with latex allergies. As if this doesn’t make you want to sink into the bath already, the Aquatec Beluga descends an impressive 2.5” from the tub’s base and reclines 35 degrees for ultimate leisure. In most cases, this battery-powered bath lift will fit in any standard home bathtub, but there are other options in case it won’t. The Wide size has a spacious 35” seat rather than the standard 28” for larger garden-style and whirlpool tubs, and the Extra Large size has a 400-lb weight capacity rather than the standard 300-lb capacity. It can also be taken with you during travel on vacations, as it collapses into a size comparable to a small suitcase. And because it runs by battery, there’s truly no fuss in regards to portability or installation. Simply pack it up, store it in the trunk of your vehicle and unfold for use at your destination! Call us old fashioned, but the most appealing part about the Aquatec Beluga bath lift is its design for safety. Once you’re seated on the device, any concern about accidentally slipping or falling will wash away. With an attached, floating pushbutton hand control at your side, you can easily raise and lower the bath lift on your own without putting any stress on your hips, knees or shoulders. And its smart safety system won’t even allow the lift to descend without enough battery power to also ascend (5-6 lifts/charge), ensuring the patient will not be stranded in the tub. This convenient bath lift chair is only a step in achieving full independence, but it’s certainly a rewarding one! In need of something else? Visit our store, and find your preferred mobility solution!